Here on the north side of Everest ropes have been fixed as high as 8300m, and the remainder will likely be fixed when the winds drop on 18th and 19th. If all goes to plan then teams will begin summiting from 20th, which means we’ll be starting our summit pushes in the next couple of days. We’re making good time. 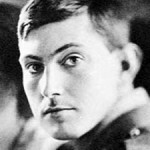 On this day 90 years ago George Mallory and Howard Somervell were making their way up to the North Col for the first time that year. They arrived at what is now Advanced Base Camp (ABC) only the previous afternoon and must have been extremely tired. When we reached ABC for the first time last month we decided to have three rest days before climbing up to the North Col on a route that had already been identified and fixed by the Tibetan rope fixers of the China Tibet Mountaineering Association (CTMA). But Mallory and Somervell decided to climb up the following day. 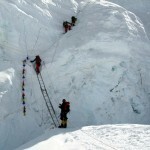 They needed to stare up the looming 400 metres of the North Col Wall, identify a route suitable for porters, and climb it fixing ropes and cutting steps as they went. They lay down on the North Col in a state of “considerable exhaustion”, but still they weren’t satisfied. They decided to investigate a little further up the Northwest Shoulder, and soon they were well rewarded when they emerged from beneath the snow balcony that overlooks the North Col campsite and found themselves looking south into Nepal. We had now and uninterrupted view of all that lies to the west. Below us was the head of the main Rongbuk Glacier. On the skyline to the left was the prodigious northwest ridge of Everest, flanked with snow, hiding the crest of the West Peak. Past the foot of the northwest ridge we looked down the immense glacier flow south-westwards into Nepal and saw without distinguishing them the distant ranges beyond. 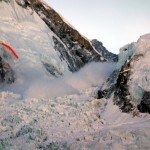 Near at hand a sharp edge of rocks, the buttress of Changtse falling abruptly to the Rongbuk Glacier, blocked out vision of the two greatest mountains northwest of Everest, Gyachung Kang and Cho Oyu. 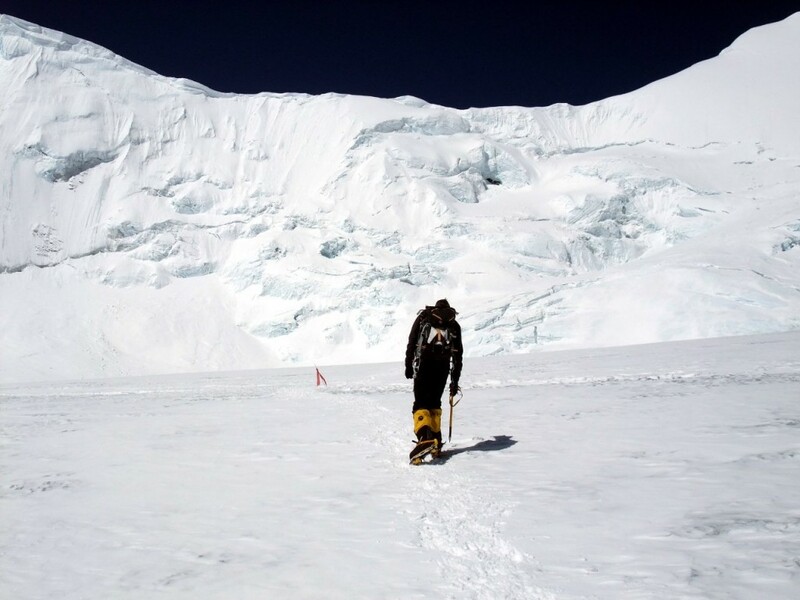 But we could feel no regret for this loss, so enchanted were we by the spectacle of Pumori; though its summit was little higher than our own level, it was, as it always is, a singularly impressive sight. The snow-cap of Pumori is supported by splendid architecture; the pyramidal bulk of the mountain, the steep fall of the ridges and faces to south and west, and the precipices of rock and ice towards east and north, are set off by a whole chain of mountains extending west-north-west along a frail, fantastic ridge unrivalled anywhere in this district for the elegant beauty of its cornices and towers. No more striking change of scenery could be imagined than this from all we saw to the east, the gentle snowy basin; the unemphatic lines of the slopes below and on either side of the Lhakpa La, dominated as they are by the dullest of mountains, Khartaphu; the even fall of rocks and snow from the east ridge of Changtse and from the northeast ridge of Everest. Pumori itself stood only as a symbol of this new wonderful world before our eyes as we stayed to look westwards, a world exciting, strange, unearthly, fantastic as the skyscrapers in New York City, and at the same time possessing the dignity of what is enduring and immense, for no end was visible or even conceivable to this kingdom of adventure. These are the views that make mountaineering worthwhile. 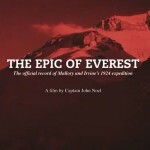 Mallory and Somervell with companions Norton and Morshead reached 26,985 feet (8225m) on 21 May that year. A week later George Finch and Geoffrey Bruce, using bottled oxygen, reached 27,300 feet (8321m). In 1922 Everest remained unclimbed, and Mallory’s obsession would simmer for two more years.